Well boys and girls, here it is, the moment you've all been waiting for, it's finally arrived, that score for that film has appeared, 'so Tom' you're thinking, 'what's it like?' Well, my answer is that it is different, definitely superb, but not possibly what you might expect. The first thing that strikes me about a lot of it is that it is possibly more innocent than the original scores were. This is not to say that there aren't any darker moments, but the light hearted moments are more frequent and even some of the action music has a Hook like innocence and balletic grace. Well, let's start at the beginning. The opening titles from the original is performed with suitable thunder and while I don't think it quite tops Return of the Jedi for best performance of the opening credits scrawl, it's not likely to be surpassed by any other performance. This blends more in the manner of the opening to Empire with wafting strings which then translate into some imposing brass fanfare which immediately set the tone for one part of this score. There are lots of broad fanfares, especially for the music associated with the Queen. The following two tracks are both concert arrangements. Duel of the Fates is a 4 minute epic choral work with running strings interspersed with bright brass and menacing (appropriately) choir. The motives from this selection appear a few times later on, but I assume there is a film version of this cue which accompanies a light sabre duel of some description. Anakin's Theme is a marvellously ambiguous lullaby which has slightly disturbing undercurrents when a hint at the Imperial March appears at the end of the phrase. It's just the right amount of suggestion that perfectly sets up Anakin's character. As I mentioned, the comedy music is a little on the increase from the first films and it comes out as some kind of cross breed of the droids music with the bouncing woodwind, but with added plucked strings and is there for Jar Jar, the comic relief for the film. The Swim to Otoh Gunga produces some splendid subliminal choral work which is suitably mysterious. There don't seem to be nearly the same number of action cues or action set pieces that the original trilogy had, but what action there is, works supremely well. The Droid Battle features a hyper action version of the Imperial March as a basic motif, but with rising woodwind and string figures. The brass certainly get a great work out here. The following cues are all a little quieter and very sublime, only interrupted by the Flag Parade which is John Williams coming over all Miklos Rosza with a cross between the Parade of the Charioteers from Ben Hur and his Parade of the Slave Children from Temple of Doom and it certainly works a treat. He is the Chosen One is very elegiac, but rising and with imposing brass toward the end becomes one of the highlights of the quieter music. Anakin Defeats Sebulba moves from quiet into a frenetic scherzo with strings tearing about and blaring brass that is just thrilling. Passage Through the Planet Core has a similar feel to Swim to Otoh Gunga with a spooky choir which transforms into a brassy action cue toward the end. Panaka and the Queen's Protectors is Williams in very Korngold-esque mode with some very swashbuckling action, which then breaks off to make way for a more ceremonial fanfare which echoes those in The Arrival of Naboo. The following cue is quite subdued but does contain more of those fanfares. The final action section starts with the Droid Invasion, although it never quite reaches the same level of intensity as The Droid Battle, but I have a feeling that the Battle might just appear after the invasion and the appearance of Darth Maul which would produce a more prolonged and sustained action segment. The actual appearance of said Darth is accompanied by the Emperor's Theme from Return of the Jedi and so presumably has some connection with Palpatine as well. 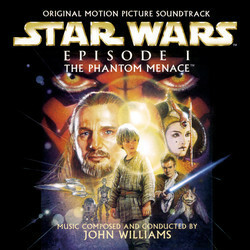 Qui Gon's Noble End begins with a brass version of the choral start to the Duel of the Fates but then moves into heavy brass and percussion making for yet more thrilling action, which is interrupted by a whispering chorus that is very malevolent indeed which then moves into more action music, using some of the motifs from the Duel of the Fates to propel everything along nicely. The High Council Meeting has a brief appearance of Yoda's Theme surrounded by elegiac string music and noble horns that sometimes recalls the Alliance Assembly from Return of the Jedi, but also with a hint at the Imperial March. The funeral music is this time done with a mass-like choir and is much more sombre than the similar event from Jedi but is interpolated with the Force Theme briefly. The final track is possibly the most disappointing aspect of the entire score. The Municipal Band will probably have some people cringing, however, there are two things which make it bearable, the first being that it's only short and the second being that it probably doesn't seem nearly as bad in the film with actual onscreen celebration. It is more like a souped up parade version of the Victory Celebration from Jedi, with high trumpet fanfares. I think it would have been improved by having one synth instrument removed since that is actually quite horrible. The transition to the end credits isn't the most comfortable and certainly not on a par with the transitions in Star Wars or Empire. After a brief section of the main theme, it dies down and then Duel of the Fates is played out in its entirety followed by Anakin's Theme, again, just as the concert arrangement. Unlike the other films, there is no heroic reprise of the main theme and there is just a sombre fading away as the Imperial March hint at the end of Anakin's Theme just lets the score disappear to nothing. It's a good idea, but will have people up in arms I think! In the film, this way of doing the credits is fine, but on an album where about 7 minutes of the music is repeated verbatim, it seems rather lazy to be honest. A shame that a couple of extra cues of score couldn't have been included instead. I think it's fair to say that some people will find parts of the score disappointing as a Star Wars score, but taken on its own terms (which really it ought to be), it's an excellent score and certainly a great deal better than many of the recent sci fi scores and certainly containing more dynamism and variety. There are no supremely great themes to take away, which is a tad disappointing. Anakin's Theme is lovely, but the way it's structured makes it rather hard to remember. Hopefully Lucas will give up his love for victory celebrations and provide Williams with the opportunity to either write something more like the Throne Room or just some orchestral ending that would blend much more successfully into the end titles. The sound quality is worth mentioning since it's absolutely splendid, the LSO booms triumphantly when required, but also the nuances of the quieter parts can be heard clearly. There's no point recommending purchase of it since more people will get this than most of the other things I've reviewed. Have an open mind, listen to it several times before complaining bitterly that it doesn't contain this, that or the other. 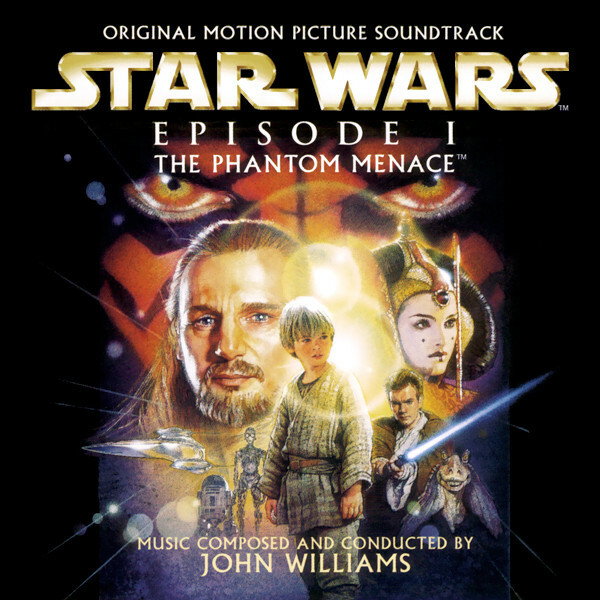 John Williams score for Star Wars: The Phantom Menace is probably the most eagerly awaited soundtrack release in the history of film music. Ever since it was announced that a new Star Wars trilogy was to be made, and that Williams would write the score, people all over the world have speculated. Will it be a 2 CD release? Which label will release it? What themes will be used? 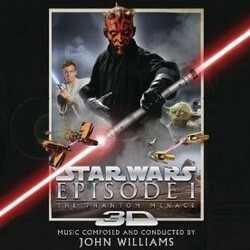 And most important - will Johnny come up with yet another classic score for the Star Wars saga? He has. And all film music fans can relax and take a breather. But do not expect it to sound exactly like the previous Star Wars. If you do that, chances are you will get disappointed. It has been over 20 years since the first Star Wars score, and we all know that Williams's style has changed over the years. If I had to compare the style of The Phantom Menace with another William's score I would pick Indiana Jones and the Last Crusade and maybe Hook. Many will probably be a little disappointed when they find out that the score isn't especially scattered with old, familiar Star Wars themes, although some short snippets from different themes show up (like Joda's theme in "The High Council Meeting"). But I think it is important to remember that this is just the first film in a series of three (or six), and I am sure that those themes, or their precursors, often associated with certain characters, which yet haven't entered the stage, eventually will crop up in future scores, in one form or another. Let's take Anakin's theme and the Imperial March as an example. The last four notes of the sweet and innocent (but complex) theme (given its best rendition in one of the soundtracks' two concert arrangements, "Anakin's Theme") for the Darth Vader to be, Anakin Skywalker, is the last notes from the Imperial March, although very sweet. But it gives the theme a very foreboding sound. Anakin will one day become Darth Vader in the same way that Anakin's theme slowly will turn into the malignant march. It's pure genius, or at least very clever, and clearly shows why John Williams is considered to be one of the greatest composers today. The music is also this time performed by the great London Symphony Orchestra, and they certainly deliver this time, too. Williams also makes use of The London Voices and The New London Children's Choir (a lot of London there!). The New London Children's Choir is used in "Augie's Great Municipal Band", but more about that later. First, let me say something about "Duel of the Fates" which features the scores' best, or most powerful, use of The London Voices. This piece was released as a radio single about one week before the release of the soundtrack. That Sony Classical decided to release this cue before the actual soundtrack, and also make a music video for it, is easy to understand - it is without doubt one of the best, and most memorable, cues on the album. 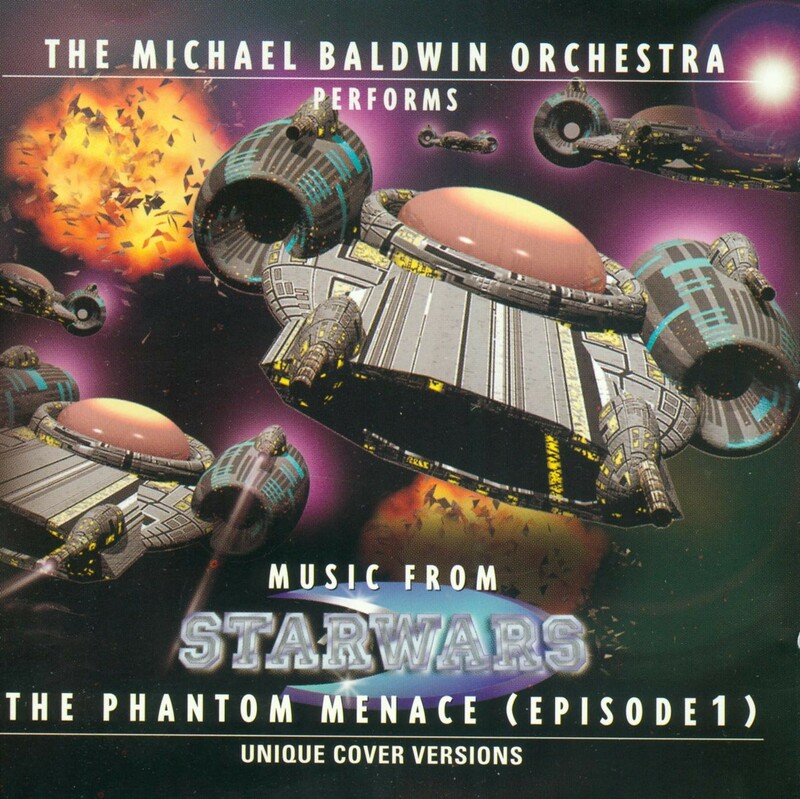 Like "Anakin's Theme" this is a concert version, and does not appear in this form in the film. It's a massive piece, with bold brass and the powerful sound of the choir bouncing off the walls. There are a couple of stand out action cues on the soundtrack. "The Sith Spacecraft and The Droid Battle" is an adrenaline pumping action piece, perhaps a little similiar to the action music in the already mentioned Indiana Jones and the last Crusade. Williams certainly knows how to use the brass section of the orchestra - the cue, is dominated by triumphant horns and blaring trumpets, supported by timpani and snare drums. It's very exciting, as is "Anakin Defeats Sebulba", which is scattered with brass fanfares, racing strings and rapid woodwinds. "Panaka and the Quenn's Protectors" is also a superb action cue, where we get a small portion of the famous main theme march, as well as the "Duel of the Fates" theme, but this time without the choir. There are also a great deal of more subtle and quiet music, like for instance "He is the Chosen One", which is a soft string based piece, with occasional quotes of Anakin's theme. "Watto's Deal and Kids at Play" is in the same style, and contains a beautiful quote of the Force theme, performed by woodwinds. "Qui-Gon's Funeral" is a sad, and unfortunately short, choral piece, with heartbreaking choral harmonies, and hints of the Force theme in the lower brass. The score also has its share of more lighearted, playfull music. The Jar Jar charachter has been given a comical theme, often performed on tuba and oboe, like in "Jar Jar's Introduction". And then we have "Augie's Great Municipal Band". This is a piece which probably will get the same response among film music fans as the "Victory Celebration" from Return of the Jedi, meaning that a lot of people will just hate it - "Augie's Great Municipal Band" is a weird piece, with synthesized brass, all kind of strange sounds and instruments, like whistles, and The New London Children's Choir, singing in a very playfull and uplifting way. To be honest, I think it is quite entertaining, and it is important not to forget that there probably is a reason it sounds the way it does. And it's rather short anyway - it's soon interrupted by the end credits music, which is a suite concisting of the main theme, "Duel of the Fates" and Anakin's theme. The ending is actually quite dark, with the last four notes of Anakin's theme/The Imperial March sounding even darker than before, foreboding a darker future. Regarding the lyrics for "Duel of the Fates"
Williams used one line from Robert Grave's translation of an old Celtic poem, "Cad Goddeu" ("Battle of the Trees"): "Under the tongue root a fight most dread, and another raging, behind, in the head". He then had the phrase translated into different languages. Williams liked the version in Sanskrit, an old Indian language, best, and decided to use it for the score.